The June 29-30 field trip took two dozen NCGS members and friends to explore the geology of the Eastern Belt of the northern Sierra Nevada. The focus of the trip was to examine the anatomy of a Paleozoic island arc and to visit a working gold mine. Most of the group met on Friday evening at the San Francisco State University Sierra Nevada Field Camp near Bassetts along Highway 49. The Camp offered “luxury camping” including large platform tents with mattresses, hot water showers, flush toilets and a dining hall with staff to prepare meals. The first day of the trip on Saturday was led by Dr. Elwood Brooks, Professor Emeritus, and Phil Garbutt of CSU Hayward. Professor Brooks has worked in the area since 1969 and his guidebook for the trip, Geology of the Eastern Belt of the Northern Sierra Nevada, is an excellent introduction to the area. 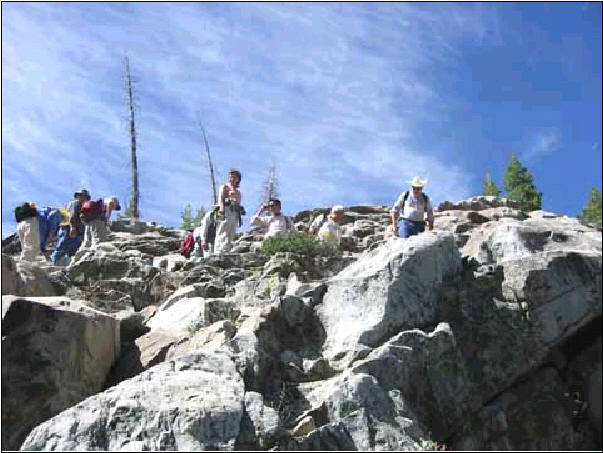 NCGS members on an outcrop of Devonian-Mississippian volcaniclastics at Upper Salmon Lake in the Lakes Basin, Sierra County. Saturday, June 29, 2002. This phase of the trip was led by Dr. Elwood Brooks and Phil Garbutt, California State University, Hayward. The day began at 8:00 with a short drive north to Upper Salmon Lake. Our hike around Salmon Lake was mercifully free of mosquitoes for this time of year due to a slight breeze. At the first outcrop Dr. Brooks began with an overview of the geologic setting. The Eastern Belt of the northern Sierra Nevada lies east of the Feather River Peridotite Belt (Melones fault zone). The belt consists of an early Paleozoic accretionary prism complex and a series of three overlying late Paleozoic and Jurassic volcanic-arc sequences. The accretionary prism is represented by the Shoo Fly Complex and is composed of quartz sandstone and mudstone derived from the North American craton. The rocks that we would be examining were the foundations of a Late Devonian-Early Mississippian island arc complex. The other two island arc complexes are of Permian age and Jurassic age. Uplift and tilting resulted in the exposure of the Shoo Fly complex in the west followed by the Devonian/Mississippian arc, Permian arc, and Jurassic arc lying progressively further to the east. The entire package tilts to the east at moderate dips of about 20 degrees. The island arcs were probably formed adjacent to the paleo-craton of North America along a west-dipping subduction zone. The Late Devonian-Early Mississippian island arc complex is represented by three formations of volcanic assemblages. The Sierra Buttes Formation is the oldest (Late Devonian) followed by the Elwell Formation (Late Devonian) and then the Taylor Formation (Late Devonian-Early Mississippian). These are overlain by chert of the Mississippian-Pennsylvanian age Peale Formation. The entire package is known as the Taylorsville sequence. For most of the day, we progressed from the Taylor Formation down section to the Sierra Buttes Formation. All of the formations appear to be deposited under subaqueous, marine conditions at a depth of approximately one kilometer of water. There is very little indication of subaerial deposition. The Late Devonian-Early Mississippian age of the Taylorsville sequence is established by conodonts and goniatites. The entire sequence was metamorphosed several times. In this area we were mostly in lower-greenschist facies rocks, although some rocks containing prehnite-actinolite facies also occur. Our first stop on our hike was Stop 7 in the Guidebook. Here we examined clastic volcanic (andesitic to basaltic) rocks of the Taylor Formation. Individual units consist of a debris-flow deposit overlain by ash flow turbidites. The debris-flow deposit consists of broken pillow basalts in an ash and lapilli matrix. The pillows are basalt and basaltic andesite with glassy rinds and vesicles. An example is shown as Figure 12 in the Guidebook. The overlying ash flow turbidites form upward-fining units that are typically less than one foot thick. Our second stop (Guidebook Stop 8) was nearby and showed discrete, unbroken pillows embedded in a tuffaceous matrix (Figure 14). The ash contains pumice clasts that have now been replaced by quartz. At our third stop (Guidebook Stop 10) we examined Bouma sequences in the ash flow turbidites. Trace fossils lie along the bedding plane of the uppermost units. Our fourth stop was along Horse Lake in a forested saddle underlain by the chert and volcanic (andesitic) rocks of the Elwell Formation. The Elwell is dominated by a brittle radiolarian chert and phosphatic units. Our fifth stop (located between Guidebook Stops 10 and 11) was in one of the upper units of the volcanic (dacitic to andesitic) rocks of the Sierra Buttes Formation. The rocks appear as a distinctive reddish-colored unit, and they represent a subaqueous, pyroclastic flow containing pumice and breccia. The unit is cut by near-vertical andesite and basalt dikes and sills. The dacite-like breccia is highly silicic. It has been proposed that the silicic magma formed by melting of both the asthenosphere and the overlying continental crustal material within the Shoo Fly Complex. This is supported by Nd isotopes. The silicic enrichment of the Sierra Buttes Formation at the base of this mid-Paleozoic volcanic arc sequence indicates that it is petrologically an inverted system. The two younger volcanic arc systems do not show this inversion. After lunch our sixth stop (Guidebook Stop 12) was an andesite sill in the Elwell Formation that is fractured into columnar joints (Figure 18). Above it is a debris-flow deposit incorporating chert with phosphatic nodules, volcanogenic sandstones, Sierra Buttes dacite clasts, and Elwell sill rocks. This deposit is the basal member of the Taylor Formation. Our final stop (Guidebook Stop 13) allowed us to see and collect world-class exposures of peperite in the Elwell Formation. Peperite forms when andesite magma intrudes into unlithified chert and phosphatic units, and then it is quenched rapidly at the low-temperature, near-seafloor conditions. The andesite and phosphate nodules fracture and the soupy chert is injected into the fractures. Dispersed peperite is formed when steam explosions are violent enough to mix all the components in a more homogeneous-looking rock. We then continued around Upper Salmon Lake and back to our cars for a return to the Sierra Nevada Field Camp for the evening. 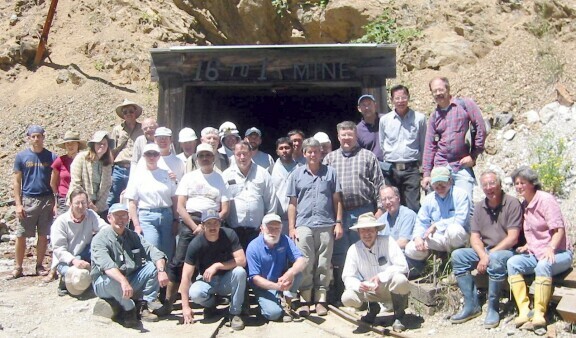 The second day began with an 8:00 start, and after some wandering along back-country roads, we managed to find the Sixteen-to-One Mine located in Allegheny just south of Downieville. 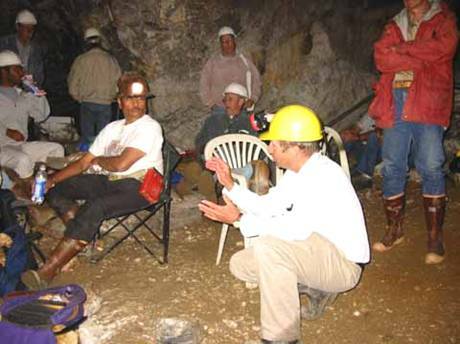 The mine tour was led by Consulting Geologist Raymond Wittkopp and assisted by miner Larry Cates. The mine is the last deep, active hard-rock gold mine operating in California. 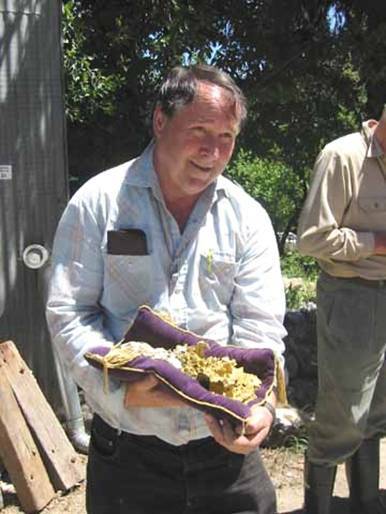 Ray provided everyone with four publications discussing gold in California and the 16-to-1 Mine. Ray began with an overview of the area, and then he described the historical and current mining practices. The 16-to-1 Mine was discovered in 1896 by miners working the nearly placer deposits. It was named for the ratio of sixteen ounces of silver to one ounce of gold proposed for U.S. coinage by William Jennings Bryan in his presidential campaign speeches. To date the mine has produced over one million ounces of gold and was one of the most productive and profitable gold mines in California. The mine was closed during World War Two and reopened in 1945. In the last decade the miners have had success using metal detectors to locate pockets of ore three to four feet behind the existing mine walls. No current reserves are booked for the mine. Any new ore pockets that are discovered are mined immediately and removed. Typical pockets are 1000 to 1500 ounces. All of the extracted ore is sold for specimens and jewelry at prices ranging from 4 to 8 times spot gold prices. After the overview we donned our boots and hard-hats and grabbed our flashlights. At the mine entrance we counted off and shuffled in single file to begin a four hour tour of the mine. With only our flashlights for illumination it took about five minutes to become used to the darkness. The cool temperatures inside the mine were a welcome relief from the hot sun outside. We entered through a tunnel that took us into the 800 foot level of the mine. All depths in the mine are measured along the dip of the vein. This 800 foot level is where the miners are currently working. From there we descended along the vein to the “Ballroom” just below the 1000 foot level. The water table in the mine is at 800 feet and below this level water must be pumped from the mine. The mine is currently being pumped to the 2400 foot level. Total depth in the mine is 3000 feet. Ray Wittcopp, geologist at the 16-to-1 Mine, discusses mine geology and operation in the mine lunch room underground on Sunday, June 30. The gold ore is located in a quartz vein system that follows the trace of a thrust fault. The fault is part of the Melones fault system that lies west of the Shoo Fly Complex that we discussed on the first day. The fault strikes north-south and dips east at about 30 degrees. The fault and veins cut through the wall rock of the Carboniferous Calaveras Group. The Tightner Member of the Calaveras Group is present throughout most of the mine and is a metamorphic unit of predominantly amphibolite and chlorite schist, quartzite, slate and serpentine. Just below 1700 feet the vein is offset by a more recent high-angle, reverse fault that drops the vein down to the east. The quartz vein varies from two feet to fifty feet with an average of about six feet. The vein filled voids along the fault plane. As the wall rock moved along an undulating fault plane, voids were formed that were later filled with a hydrothermal fluid that transported the quartz and gold. Geochemical (isotope) analysis indicates that the origin of the veins originated at a depth of about six km. The age of mineralization is approximately 108-127 million years. Hydrothermal fluids, rich in carbon dioxide, moving along the fault zone caused alteration of both schist and serpentinite by sulfidization and carbonatization. There is evidence that both the silica and the gold may have been leached from the walls themselves. Carbonate rich solutions appear to be the key for the formation of the gold deposits. It may be that the Mesozoic intrusions in the area are the engines that drive carbonate-rich fluids to leach gold out of the country rock. These same fluids are responsible for altering serpentine to the distinctive blue-green rock called mariposite. Where the fluids encounter a void along the fault plane, there is a drop in pressure that may precipitate quartz and gold from the solution. All gold is found within quartz veins. There are five general indicators of which veins typically contain gold. 1. Gold is typically found within 100 feet of where the fault cuts through a serpentine body in the wall rock. 2. Gold is found where mariposite is located in the upper part of the vein near the hanging wall, or where mariposite is found as blocks (horsts) within the quartz veins. 3. Gold is located near where the fault pinches and rolls. 4. Gold is found in areas where there is an abundance of fault gouge. 5. Gold is found where quartz has a greasy looking appearance and has numerous fluid inclusions. Phil Garbutt of the Cal State Hayward Geology Department admires “The Whopper,” an enormous gold nugget found at the 16-to-1 Mine, Alleghany, California. After a group photo in front of mine everyone went to the mine office to have a look at the ore specimens recovered from the mine. A number of members purchased hand specimens of quartz laced with small veins of gold. The NCGS sincerely thanks Dr. Brooks and Phil Garbutt for the excellent field trip through the Taylorsville sequence, and Ray Wittkopp and Larry Cates for the exciting trip through the mine. Jean Moran did her usual superb job in arranging food, transportation, camping facilities, and handling trip registration. Our thanks also to all of the drivers for driving the cars and vans. Finally we thank the staff of San Francisco State University Sierra Nevada Field Camp for the use of their facility and their hospitality. 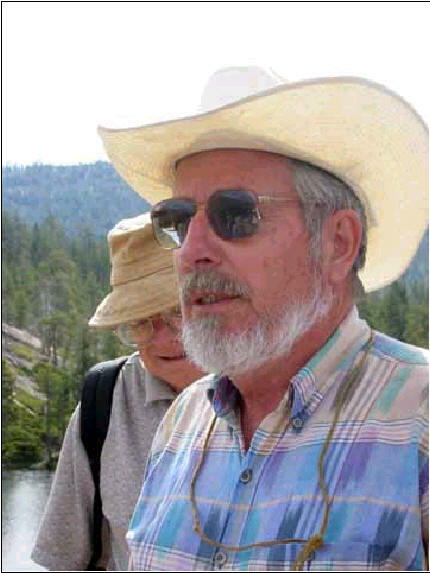 The NCGS sincerely thanks Michael F. Diggles, geologist with the Western Publications Group, USGS Menlo Park, for making his pictures available to us. More pictures from the June 28-30th 16-to-1 Field Trip can be found on his website.